This new pet added in 7.3 spawns inside the snow globe located at Ironfoge and Orgrimmar during Feast of Winter Veil 2017. Respawn time about 30 mins. This new pet respawns inside the snow globe during Feast of Winter Veil, located at Ironfoge and Orgrimmar. 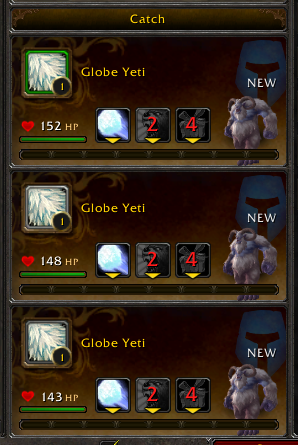 When you try to capture globe yeti, Terrible Turnip would be helpful. Weakening Blow will make the opponent always survive. It's not tradeable (because you can't put it in a cage). Make sure to use a pet with Superbark or simmilar abillities (if your pet has a high level), because the yeti is level 1! MAKE SURE YOU HAVE A Terrible Turnip or a Molten Corgi Molten Corgi - something that takes it down to Health no less than 1 like Superbark Superbark. Use Silverdragon and add mob ID 128156 - Screen will flash when it pops. You can watch Netflix on one monitor and have the second monitor waiting for the flash. I bound #1 to the macro for the /tar Globe Yeti and j to interact. Bam! Easy. I had Scraps and Corgi Pup ready with Superbark so as not to kill the Globe Yeti. Who makes them? How do they get there? No one knows, except maybe Greatfather Winter.